KANSAS CITY, Mo. — We know food deserts are an issue in east Kansas City. Pile that on top of the fact that nearly 10 percent of people on either side of the state line don't have reliable transportation, and you have a stressful problem. “About 40, 48 minutes is what the map says,” said Kayla Vincent. That's how long it takes Vincent to get to a grocery store from her bus stop at Armour and Troost. “It's worth it because I don't have to take two different buses,” said Vincent. A discount supermarket chain is down the street from her house, but it doesn't have the food she wants, so she makes the trip to Price Chopper at 85th and Wornall. If we can't make it easier to get the food to the people, why don't we make it easier to get the people to the food? That's where KC Healthy Kids and the bus system come in with a developing program. “Thousands of people in Kansas City rely on taking bus to do their grocery shopping,” said Mamiko Vuillemin, Policy Assistant for KC Healthy Kids. Vincent says nearly everyone she knows faces the same transportation issues she does. KC Healthy Kids is now partnering with the KC Area Transportation Authority to make that process a little easier. They assessed dozens of bus stops near 21 grocery stores on both sides of the state line. They installed new signs at each stop as the first step in the Fare Food Shopping program. 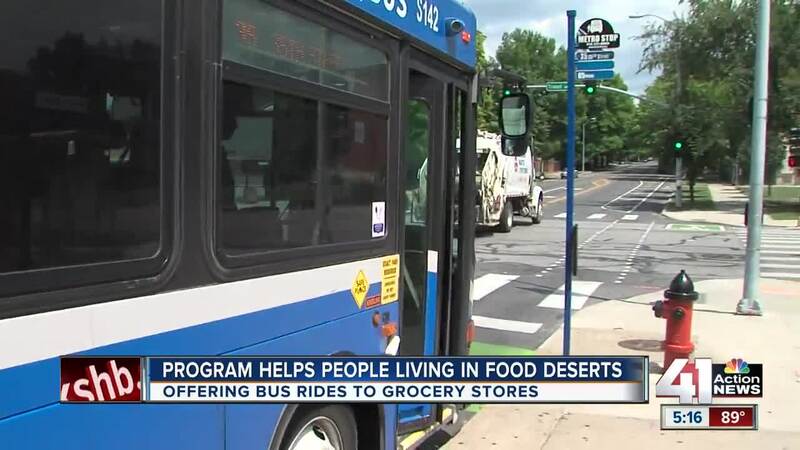 “If we're able to tell people that there's all of these routes that go directly to these grocery stores, it makes making the right options, the right food choices just a little bit easier,” said Cindy Baker, spokesperson for KCATA. The signs show a little map with the fastest route someone needs to take to the nearest grocery store. The next step will involve the city. “Looking at the physical infrastructure of the bus stops. For example, is there a shelter, is there a bench you can sit on when waiting for bus. Is the sidewalk safe? Or sometimes you have to cross a busy intersection with a bunch of grocery bags in your hands. Is the crosswalk visible?” Vuillemin said. One store the Fare Food program assessed requires bus riders to walk up a grassy hill from the bus stop, which is likely not the best option for everyone. Vuillemin said they’re hosting focus groups and having bus riders fill out a survey to gauge needs. They’re even exploring the option of shuttle buses specifically for grocery stores. That’s something Vincent said she’d love to have. Unsurprisingly, a concern for riders is space on the bus for bags. Baker said riders are welcome to bring a collapsible cart on the bus, but people have to make sure they can hold their bags. That’s a problem for Vincent, who has to sometimes limit what she buys at one time. She suggests cubbies under the seats or maybe even overhead storage, like you’d see on an airplane. Baker says they’d love to put more buses on the street to reduce transit times but said that depends on funding. The Fare Food Shopping program may not solve the food desert problem or put more buses on the streets right away, but Vincent says the signs could help other people like her. “I think they should get that out there and get that on the bus stops where people can see it,” said Vincent. The program also offers recipe ideas that require less ingredients and less bags.